This collectors edition is the seven signature edition and is signed by the following veterans who took part in the historic Dambusters Raid. Ray Grayston had been serving in 50 Squadron when he was posted to 617 Squadron in March 1943. The flight engineer of Les Knight's Lancaster AJ-N, they attacked and successfully breached the Eder Dam. Ray was shot down on 16 September 1943, and was taken to Stalag Luft III as a POW. Joining the RAF in 1940, George Johnson served with 97 Squadron before joining 617 Squadron. Bomb Aimer on American Joe McCarthy's Lancaster AJ-T, they attacked the Sorpe Dam, for which he was awarded the DFM. Commissioned a few months later, George retired from the RAF in 1962. New Zealander Les Munro was the Captain and pilot of Lancaster AJ- W assigned to attack the Sorpe Dam, but was forced to turn back en-route to the target after heavy flak-damage over Holland had rendered his aircraft unable to carry on with the opera­tion. 'Doc' Sutherland was the front gunner on Les Knight's Lancaster AJ-N that went to the Mohne Dam, and then successfully attacked and breached the Eder Dam. Shot down four months later, he managed to evade capture and escape back to England with the help of the Resistance movements, returning through Holland, France and Spain. Grant McDonald was the rear gunner on Lancaster AJ-F flown by Ken Brown. On the way to the Ruhr, the gunners shot up and damaged three trains in an eventful trip before reaching the Sorpe Dam. 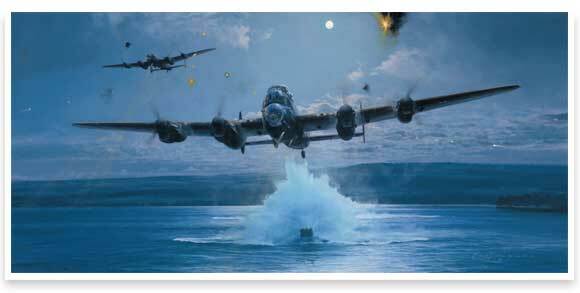 Vital to the whole Dambusters operation was the complete dedication by the ground crew of 617 Squadron, personified by Beck Parsons. Joining the RAF in 1940, he trained as an electrician and worked with Avro Manchesters with 207 Squadron at Waddington. In March 1943 he was posted to 617 Squadron at Scampton where he flew with Barnes Wallis during the tests on the bouncing bomb'. As Electrical NCO Beck was responsible for the electrics on 'B' Flight at the time of the raid, together with 'Top Maintenance' on five of the Lancasters, including those of Guy Gibson and Mick Martin. Ken Lucas joined the RAF in June 1940, and trained as ground crew for Bomber Command. He was sent first to 49 Squadron at RAF Scampton, before transfer­ring to 617 Squadron upon its formation. Involved in all the major servicing of the aircraft, Ken was heavily involved in carrying out the modifications to the aircraft before the raid, including fitting the motors that drove the belt that spun the bomb, and attaching the crucial lamps to the underside of the aircraft.